Thunder reminding Syonide that she’s bulletproof. In just a single season, Black Lightning’s already tackled systemic racism, police brutality, and gang violence, but last night’s episode proves that the show will stop at nothing to tell even more timely, resonate stories about the real world evils that we seemingly can’t escape. In Black Lightning’s Freeland, death is not an absolute. Those who die may very well come back, but their resurrections all come at a terrible price that none of them are quite ready to understand. “The Resurrection and the Light: The Book of Pain” isn’t Black Lightning’s most interesting episode in terms of plot development or character growth, but it’s a welcomed polishing of the show’s already fantastic approach to giving its heroes the opportunity to fight evils that really resonate with you as a viewer. Even though it’s been a good while since we last saw Tobias Whale, his return is a momentous one because it symbolizes the ASA’s renewed desire to eliminate Black Lighting and get back to perfecting the very same formula that first gave birth to Freeland’s metahumans. Thanks to his nifty, experimental back implants and questionable drugs, Khalil is back, walking again, and sporting a ludicrous dreadlock wig that he explains to a shocked Jefferson is the odd side effect of his newly fast-growing hair. Jeff’s bumping into Khalil shocks them both, but what seemingly sticks with Jeff is that fact that Khalil’s recovery is almost assuredly connected to Tobias Whale and the 100. The 100 has never been Black Lightning’s ultimate Big Bad™, but “The Book of Pain” does a solid job illustrating why the gang’s operation in Freeland is part of a larger scheme that none of the show’s heroes are really equipped to take down on their own. As payment for his medical recovery, Khalil is the 100's latest recruit hellbent on destroying Black Lightning and the show handles his newfound villainy in a very interesting way. Thanks to his implants and the drugs, Khalil’s now superhumanly strong, and because the ASA is now certain that Jeff is Black Lightning, the mission to take him out isn’t limited to super-heroic brawls in the street—they’re coming for him in his civilian guise. At Whale’s behest, Khalil heads to Garfield High with a plan to storm the school’s student body in order to draw out Black Lightning and Thunder. As CW campy as it could have been, the attack was honestly terrifying because, for all intents and purposes, it was Black Lightning’s rendition of a school shooting. 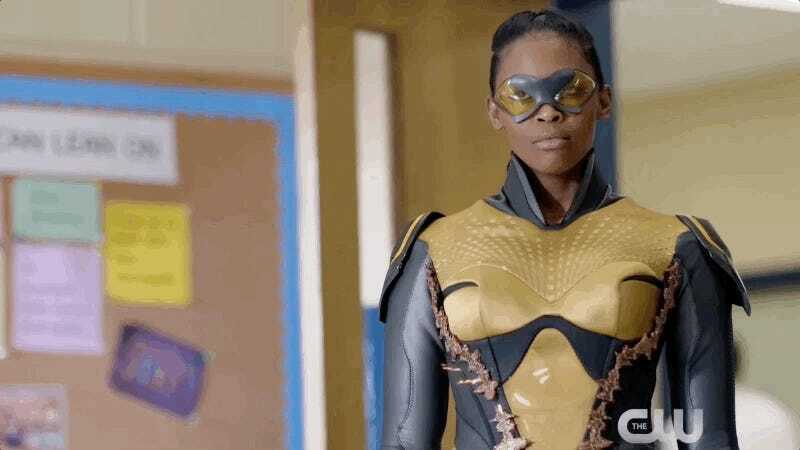 The terror in these scenes is palpable, and even though Black Lightning’s larger plot requires that the story moves past it, the show makes sure to impress upon you just how traumatic the shooting is. Instead of a proper gun, Khalil wields a wrist-mounted launcher that shoots darts filled with what very well be Greenlight, and even though he doesn’t appear to actually kill anyone, the attack has the potential to change everything about Black Lightning. “The Book of Pain” explains once again that the ASA’s interest in Freeland started as a plan to develop a drug that could keep people docile, but a preponderance of deaths and a handful of metahumans were the only products of early experiments. It isn’t explained just what’s in the needles that Khalil fires off, but it appears to be Greenlight, which the episode also confirms can sometimes imbue users with metahuman abilities. Multiple people are shot, but it’s Black Lightning who ends up paying the ultimate price. With Whale’s help, Khalil is able to actually kill Black Lightning briefly and it’s only because of Jennifer’s distraught, reluctant use of her new powers that the hero’s resuscitated. Jeff’s temporary death isn’t at all surprising given how many characters Black Lightning’s already killed off, but Jennifer and Anissa’s witnessing their father dying is a heartbreaking reminder that the ASA isn’t at all playing around or concerned with the emotional well-being of Freeland’s citizens. What “The Book of Pain” lacks in terms of sprawling plot it more than makes up for in its intensity. Hopefully, Black Lightning is saving its biggest showstoppers for next week’s season finale. • Can we talk about Jeff’s funky electricity, though? • I’d like to go on the record as saying that, for whatever reason, Hollywood hasn’t quite perfected dreadlock wigs yet. Both China Anne McClain and Cress Williams were visibly gagged at how silly Jordan Calloway looked. • The cake that Lynn ends up baking at Jennifer’s request is the most home cake I’ve ever seen on network television. • What is Syonide, exactly? When Thunder knocks her over with her seismic clap back, there’s a brief moment where we see that her flesh is some sort of yellow-green mesh beneath the skin. Perhaps she’s a meta or some kind of cyborg. • When Black Lightning’s fighting Tobias, I don’t know why he didn’t just zap him in the face instead of his protected torso. Seems like the sort of thing he’d have perfected given how much we’ve seen his powers become more precise.